Posted on Mar 8th, 2014. Thinking about the Amtrak Writer’s Residency has reminded me of train trips and railroad stations in my past. Some of which I’ve never written about. 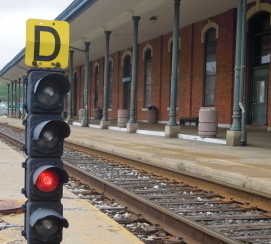 The country’s oldest continually operated train station is in my hometown—Jackson, Michigan. When I was going to college, my girlfriend and I often travelled by train, and train stations were sometimes places of sad parting. Where our hearts and souls are one." That was 1979. We moved in together later that year, got married after that. 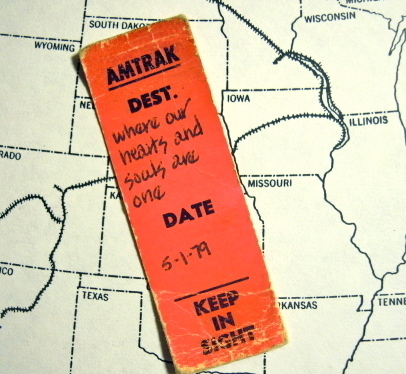 The Amtrak stub says “Keep In Sight,” and I do. Her note is always on my shelf, where I can see it when I write. Our hearts and souls are still together, and always will be. I can hear her in the next room as I type this. One thing that struck me is that I’ve written a lot about trains, but very little about stations. I was thinking about that last week, when I met my wife at King Street Station in Seattle during the week of AWP, the national writer’s conference. The station looks great now, after a $50 million-dollar renovation. Harriet and I lived in Seattle ten years before moving to Portland, and there were a lot of partings and reunions in that station. 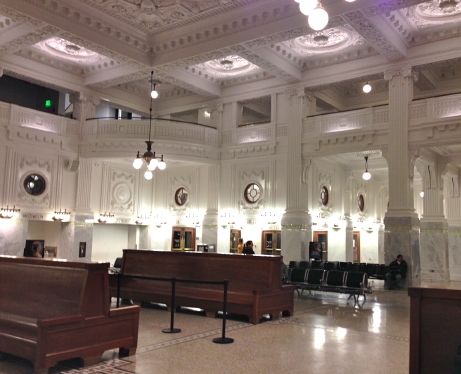 Union Station in Portland is also something to be proud of. Last year on Train Day, we saw the White Bird dance company perform Le (Petite) Grand Continental with a hundred or more dancers. It’s also where I chose to pass out free books on World Book Night. I went up to people in the station and offered them a copy of Alexis Smith’s great book, Glaciers—because what better place to read than on a train. 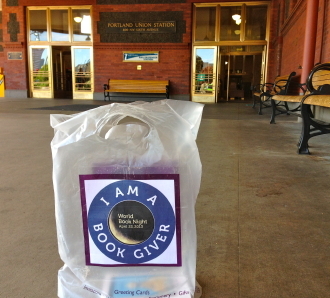 Even the Amtrak ticket clerks took copies, and I ran out right away. Outside Union Station. You can see the last copy of Glaciers in the bag. The residency application also made me re-read the first story I ever published, a short piece that won a Seattle Arts Commission grant. It’s called “It Was A New Time,” and it was the basis for what became Wire to Wire. 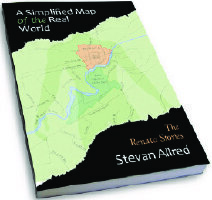 It’s not available in print anymore, but here’s how it starts. It was a new time and we rode slam hard, rode it on flatcars and hoppers and bulkhead flats, in empty woodchip cars, gons, auto ramps, and piggies all over the west, the prairies and dirty western towns of district nine—Kalama, Lillooet, Sutter’s Portage, dozens of towns seen from the frame of a boxcar and eyes numb past blinking. Towns of dust, where dirty kids threw rocks at the train—in laziness, not maliciously—and empty towns on the straight flat where the last lit beer sign burned 30 miles into the night. We rode quartermile track, Coe and I, seamlessly rolled rail laid eight to a measure. Every seven seconds on alternate sides of the car, we hit the end of one of those quartermile sections of rail, hit a beautiful ringing rimshot of metal and speed over cement-tied Great Slave track. But time was a fitful helmsman that summer and had not always run so new. Those beautiful ringing rimshots that train wheels make on the track—I hope to hear them again soon. The Jackson, Michigan Amtrak station in 2011, and me inside the station in the 1970s. 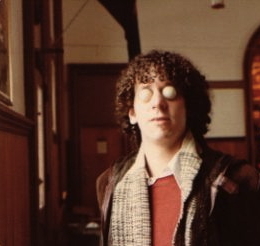 With ping pong balls over my eyes. Because the "Relaxation Expert" where I worked said that was a good way to relieve stress. It wasn't—but it was good for a laugh. Love and trains, the two great themes. "When the train left the station, it left two lights on behind..."
Posted on Dec 6th, 2013. Posted on Sep 23rd, 2013. 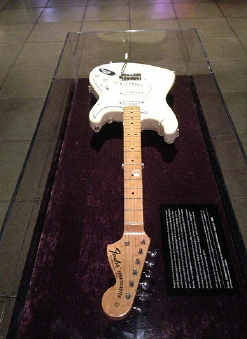 At the Hendrix museum in Seattle, you can see Jimi’s famous white Stratocaster, the guitar he played at Woodstock. It’s in a temperature and humidity controlled case, having been purchased for the Experience Music Project by Microsoft co-founder Paul Allen for an undisclosed amount. Around $2 million, the Internet rumors say. How much Hendrix valued the guitar is another matter. It was clearly important to him—but it’s also true that Jimi lived in the moment, and his guitars came and went. According to drummer Mitch Mitchell, Hendrix rather casually gave him the White Strat after what would turn out to be his last live performance at the Isle of Fehmarn in September 1970. There was also a black Stratocaster, whereabouts currently unknown, or at least unproven. If the White Strat is one of the most expensive collectable guitars in the world, the Black Strat (called the Black Beauty by most Hendrix gearheads) is one of the most mythologized. We have the word of Monika Dannemann—who was or wasn't with Jimi when he died and who was or wasn't Jimi's girlfriend, depending on which books you read and whom you believe—that the Black Strat was even more precious to Jimi than the White Strat. We also have Charles Cross’ exhaustively researched Hendrix biography, Room Full of Mirrors, in which Monika does not seem to be truthful about even the most basic facts of Jimi’s death and their relationship. That fact that she ended up with the guitar, at least for a while, might conceivably have played a role in what she said about it, and what she said Jimi said. 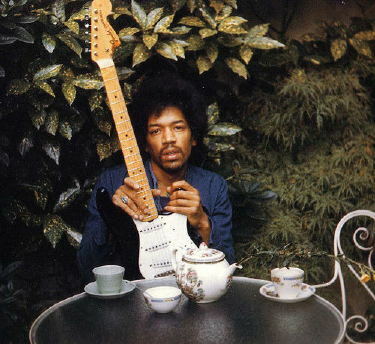 Still, one thing about Monika is certain: she took the last photos of Jimi, sitting in a London garden the day before he died. In most of the shots, he’s holding the Black Strat. Proving not very much, but starting the legend. WIthout a doubt, it's the rarest of rare guitars, a gearhead's Holy Grail, and that makes it practically priceless. And yet, if Jimi's looking down at us, I have to wonder if he might be laughing and telling us it's just a guitar. We can't ask Jimi, of course, and I don't know how to ask the axis. So we turn to the Internet instead, which provides enough Hendrix/Strat rabbit holes to keep entire data centers buzzing until a golden wing ship passes our way and just keeps on going. It was his favorite guitar, it was just one of many, Scorpion's guitarist Uli Jon Roth has it, Janie Hendrix has it, Jimi died because of the guitar, his manager murdered him, the cursed guitar led to Monika’s suicide, Monika was murdered…stock up on supplies, head to your wi-fi enabled bomb shelter and spend a couple of years tracking down the threads. You'll have fun. If you do, you’ll see my footprints on a lot of those trails, because the black Fender Stratocaster serial number 222625 fascinates me. In the book I’m currently working on, Dogs Run Free, a guitar player I call Ray Raims is searching for the Strat. His brother gets his hands on it—but then the brother and guitar disappear. It’s a decent plot device—I hope—but the guitar is also a marker for the questions of value and worth that are behind so many issues that mess with us today. The monetization of everything. The elevation of celebrity over talent. Wall Street greed. Occupy. Take, for instance, those highly valued credit default swaps that turned toxic and wrecked our economy—were the bankers who sold them any more honest about their true value than Monika Dannemann? The Hendrix guitar isn’t the main story in Dogs Run Free, but I keep coming back to it partly because it’s out there somewhere, in some pawnshop maybe, or more likely some vault, along with all these questions about money and the way we live. As Dylan wrote and Jimi sang, sort of, none of us along the line seem to know what any of it is worth. I'll be reading a little of Dogs Run Free at LitHop on October 2. If you're in Portland, stop in at Bar of the Gods on SE Hawthorne. I'd like to see you. LitHop PDX starts at 7:00 and the lineup of readers is amazing. Posted on Jul 7th, 2013. You’ve been to the beach. You put a Petoskey Stone in your mouth to see if what they say is true. You got the rental car stuck in the sand. Now you need something to read. Everybody’s got recommendations and there’s a lot of good stuff to choose from. Here are four more to put on your list. You say you love language? You get high on writers who are word-drunk? If you haven’t read The Listeners I’m not sure I believe you. The language is stunning, as are the characters Zumas creates. The fractured way she assembles the story is amazing. Should have been a huge best seller, could still be. Go buy it. Lord of Misrule won the National Book Award for fiction in 2010. She Drove Without Stopping came earlier, with the same intense power of perception and absolutely gorgeous language, focused on a young woman and her escape from a torturous home life and practically everything else. There's a wounded-strong adventuress without limits, a despicable father, a passive mother...the ride goes from Maryland to a hippie college in Ohio to LA and every page has something to stun you. Must read. Teenagers on the edge of society. Nothing working like it should. No story going where you think it’s going to go, until it gets there and feels like it was inevitable all along. 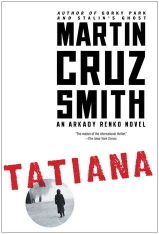 The boy/man with the kitchen knife trying to rob the woman at the ATM, who turns out to be someone he dated, who turns out to be…ah, you just have to read these. Bleak, strong, desperate worlds, and so true to life I'm afraid to wonder how she knows all this stuff. I feel sure I’m missing some great books here, and there’s a bunch on my summertime TBR list that I think I’m gonna love. Once I get the car out of the sand, I may add some more. Posted on Mar 26th, 2013. It's turning into Seger week in Portland. A writer from Esquire called, wanting some quotes about "Night Moves." My essay on Seger as a lyricist is running in the Portland Mercury. And Seger plays the Rose Garden here Saturday night. So, to get in the spirit, I'm adding a post a day about Seger on Facebook. Here they are so far, collected. My own personal Seger week is starting now, with a song I first heard as a teenager. I still sing the last line to myself whenever the world tries to make me into someone I'm not. Which is to say, all the time. J.J. Cale. Rodney Crowell. Otis Clay. Albert King. Peter Green. I learned about all these artists from songs Bob Seger covered. He even named an album after a Leonard Cohen book, way before Cohen's current popularity. And of course, Tom Waits. No one has covered Waits more often than Seger. Claim differently and he'll whittle you into kindling. For Seger Week Part 3, not just a cover, but a complete reinvention of Midnight Rider. With the Muscle Shoals Rhythm Section and the most perfectly minimalist guitar solo you'll ever hear, from J.J. Cale. Unfortunately, Joe Cocker's cover of Midnight Rider was released just before Seger's, and that was that. Okay, so Seger was rockin' it in the early days. What about something from this century? It can't all be cornfields and the backseat of a '60 Chevy, right? Fair enough. You want up-to-date? Try this song about what to do before the sun burns us all up.